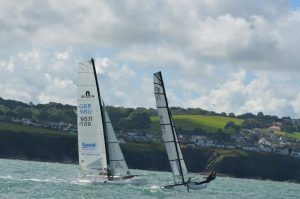 Welcome to Tresaith Mariners Sailing Club, a coastal catamaran and dinghy sailing club in West Wales. 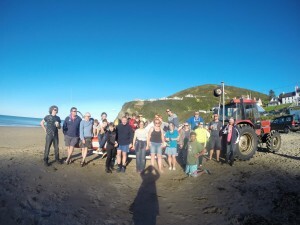 We run training nights on a Wednesday evening as well as Sunday racing and several summer regattas and beach parties. The F18 catamaran fleet also regularly attend national and international events. See the links in the menu above for more details. Click on the image above for more details on how to try sailing at Tresaith this May. We are very pleased to be hosting the British F18 Catamaran Nationals on the August Bank Holiday weekend (24th – 26th August 2019). More details to be posted very soon, including the Notice of Race – but you may wish to book accommodation now – we will, as always, have our very popular beach bar in the marquee on the beach, along with live music till late and great food. There will also be a race training weekend the week before, and you are welcome to leave boats here in-between. More information including Notice of Race and Sailing Instructions will be posted here. The date for the club regatta is the 3rd & 4th of August 2019. Again beach bar in the marquee on the beach, along with live music till late and great food. All dinghies and catamarans welcome – there will also be races for our beginners and junior sailors. Members of the Tresaith Mariners Sailing Club have been successful in raising funds for a defibrillator to make the club, the beach and all its visitors heart safe. Having the defibrillator installed on the outside of our building means that, through its link to the Local Ambulance Service, it is available to everyone at the Club and the local community 24/7. The defibrillator was installed in June 2018, in time for the busy summer ahead. To join click on our membership page.